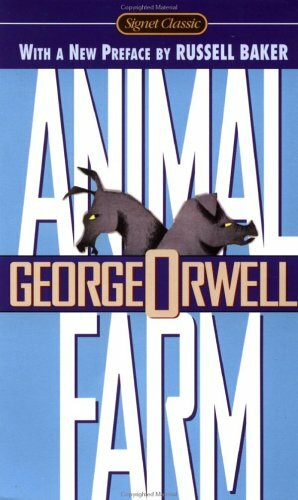 From Goodreads: Tired of their servitude to man, a group of farm animals revolt and form their own society, only to be betrayed into worse servitude by their leaders, the pigs, whose slogan becomes: “All animals are equal, but some animals are more equal than others.” An incredibly spot-on satire of the Russian Revolution under Stalin, Animal Farm has certainly endured through the years since its original publication in 1945. As someone who knows very little and cares even less about history, I probably didn’t get as much of this novel as I should have. However, it’s safe to say I understood it quite a bit better than I did the first time I read it, back in eighth grade. Since we hadn’t done much world history at that time, Animal Farm and all its references went straight over all our heads. (At least, I know it went straight over mine.) All I really understood about Animal Farm at that point was that a novel about talking animals becomes vaguely unsettling when it’s not a fairy tale. I know at least one of my friends was substantially freaked out by it. Ten years later, I understood that it was supposed to be a satire of the Russian Revolution, that Napoleon represented Stalin, Snowball was Trotsky, etc. etc. This has absolutely nothing to do with Animal Farm, but I can never think of Trotsky without thinking of this. It also reminded me quite a bit of 1984 (I wonder why), especially at the points where the pigs would manipulate the “charts and data” to show that the animals were eating more, working less, and were generally happier than they had been before the rebellion. It was really easy to see how poisonous leadership like that can really take hold--both of the leaders and of the followers. It’s also a really quick read--it’s only a little more than 100 pages, and I think it was originally written for children, so it uses pretty simple, didactic language and not a lot of dialogue. Now, I can’t really say I like this book as much as I appreciate its literary and satiric value. I can’t really say I’d want to read this multiple times, as I’ve done with 1984, but I’m glad I did reread it at least once, when I was much older, to really understand what was actually going on. Bottom Line: This is great satire, but I don’t really care enough about history to make an effort to really delve deeper into it, so I’d say I’m probably not the best audience for this book. I’d recommend this book for: Those who enjoy and know at least a little about the Russian Revolution. I think I was too young and wasn't ready for it when I first read Animal Farm, and though I'm pretty sure I knew it was a historical allegory of some sort, I hadn't studied the Russian Revolution at that point so I didn't get the parallels. Like your friend, however, the story itself freaked me out, lol. Historical allegory aside, it's still a dark read! The ending totally creeped me out. I really should re-read it and see how I react now that I'm much older. I'm reluctant to, though, given I still have those negative mental associations. Yay! I'm so happy to see someone give the classic a try because this was always one of my favourites (although as a kid, it may or may not have had something to do with the animals). I agree, as a youngster reading it, I had absolutely NO clue about the over-arching themes. But as I got older and developed a huge appreciation for history, the book again wormed its way back into my heart. This is one of those stories that I recommend to folks who are lookingn to delve into the classics if only because I thought it was a clever way to introduce the Russian Revolution and it's a fairly quick and easy read. I read it for the first time last week. Although I, like you, don't have a deep understanding of Russian history, I think it can still be relevant to leaders and power in general. I think that understanding the historical context will make the read so much better, but if you think about it, it's just basically about what happens when there is a change of power. The main theme I got from this book was that everyone wants a revolution, but when they get it, they change their mindsets and become just like the people they hated. Very much agreed! It specifically illustrates why communism fails, despite how good of an idea it sounds like at the outset. I read this a few years ago and understood it not as well as I would have liked-thanks to wikipedia and such though, I ended up with more appreciation. I really like Orwell's writing!